Here are maps of the Syrian war showing who controls what after seven years of fighting. Eastern Ghouta, an area east of the capital Damascus, was the focus of a fierce offensive by President Bashar al-Assad’s forces in April, resulting in more than 1,000 deaths, including those of 215 children, and 145 women. On April 12, all of the rebel-held enclave was taken by the Syrian army and Russian military police patrols after all opposition groups agreed to evacuate. Elsewhere, in northern Syria, Turkish troops and allied Syrian rebels have been deployed to the Kurdish enclave of Afrin to confront a US-backed Kurdish militia. The allied forces have now taken the main city of Afrin. ISIL: The presence of ISIL is now limited to al-Hajar al-Aswad, south of Damascus, and Albu Kamal. Forces loyal to Syrian President Bashar al-Assad are intensifying their offensive over key rebel-held towns in the southern province of Deraa. 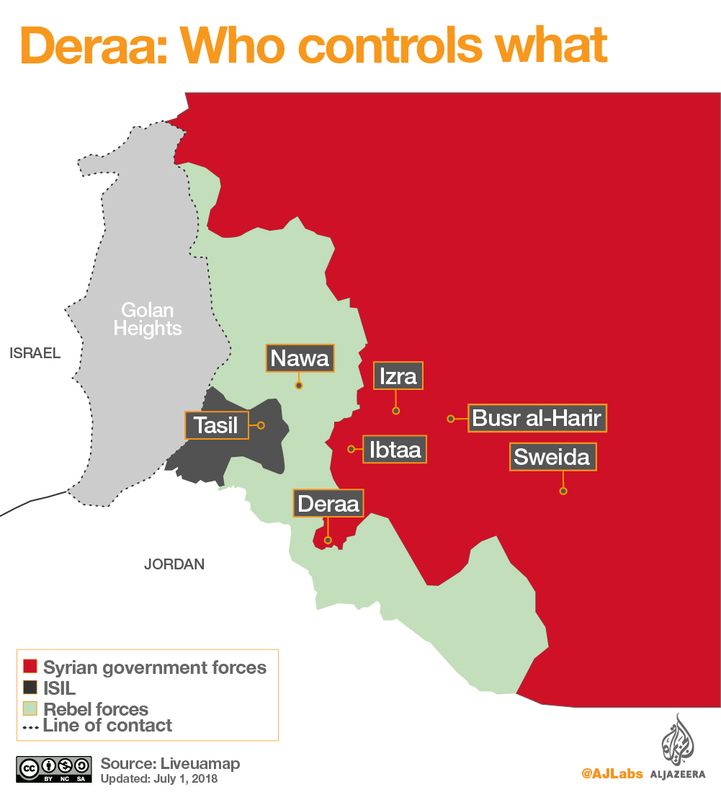 A government’s offensive this month in southwest Syria has taken much of the eastern part of Deraa province from rebels, backed by a bombardment that the United Nationssays has pushed 160,000 people out of their homes. Main cities under government control are: Damascus, Homs, Hama, Aleppo, Latakia, Tartus, Palmyra, Albu Kamal. The Free Syrian Army (FSA) is a loose conglomeration of armed brigades formed in 2011 by defectors from the Syrian army and civilians aiming to topple President Bashar al-Assad. Since the battle of Aleppo, the FSA has remained in control of limited areas in northwestern Syria. Main areas it controls: Idlib province. Main cities under Kurdish control: Raqqa, Qamishli, Hasakah.